Interests:history, art, RPGs, martial arts, Snow By Night, mysteries, language, and learning. The A-20G model was produced more than any other variant of the A-20, with 2,850 aircraft built. It was the first model with a solid nose, and while initially armed with 4 x 20mm cannons, reliability issues led the USAAC to replace the cannons with 6 x .50-cal machine guns mounted in the nose and forward fuselage for the remainder of the production run. The A-20G-25 also featured a Martin power turret, introduced in the G-20 block, which replaced the dorsal gun. The turret could rotate 360 degrees and was armed with 2 x .50-cal machine guns which could be pointed almost directly upward to provide all-around defensive fire in the upper quarters. Additionally, the A-20G had a rear-facing ventral gunner, for a total of nine .50-cal machine guns, as offensive and defensive armament. Coupled with a 2,000 lb internally carried bomb load, optional bazooka armament, good armoring and impressive speed, the A-20G was one of the most formidable attack aircraft of WWII. The A-20G-25 was primarily used in medium altitude bombing by the USAAC in the European theater, but in the Pacific, it was used primarily for low-level bombing and strafing runs, and it is in the latter role that the aircraft excels in War Thunder. In Air Arcade Battles, the tactics for the A-20G-25 are fairly straightforward. Look for a grouping of high value targets (i.e. tanks, pillboxes, ships, etc. ), and go full throttle in a straight line towards them. Once you’re close (a few hundred feet above the targets), drop your bomb(s). A single one of the four 500 lb bombs can take out a destroyer, a heavy tank or a pillbox with a direct hit, making it possible to take out multiple ground targets quickly. 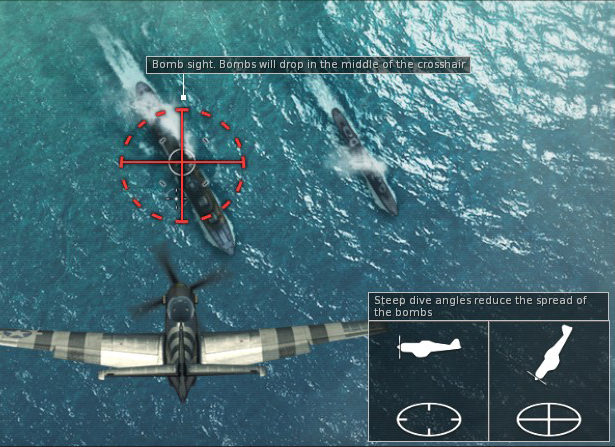 When bombing moving tanks and ships, remember to lead your target and place the crosshairs just in front of the vehicle before bomb release. Bombing a moving target takes some practice, as your lead distance is dependent on your speed and altitude. When bombing stationary targets, wait for the bombing reticle to turn red before releasing, and err towards the front of the target (the part facing your approach). Once you’ve dropped your last bomb, keep flying in a straight line, gain some distance, and wait for your payload to reload before turning around and repeating. Keeping up your speed (using WEP) will help you put space between you and any enemy aircraft, and the 2 x .50-cal turret can be quite effective at dissuading, if not destroying, enemy pursuers. If you find yourself with enemy aircraft attacking you from head-on, your best bet is keep building speed and to try maneuver out of their line of fire at the last minute, or, go head-on and start firing your 6 x .50-cal machine guns once the enemy is about 1 km from your nose. The .50-cals, preferably loaded with AP-I ammo, are capable to taking out just about anything in the sky in short order, especially head-on. If you take a few hits, don't worry, as the A-20G-25 can take quite a bit of punishment and still keep flying, and it’s cockpit is well armored in the front. In Air Realistic Battles (and Simulator Battles), your tactics are similar to those in Arcade Battles, but with some important differences. You need to be mindful of your dive speed, as your wings can rip off at around 412 mph (663 kph), though getting to that speed should be difficult under normal circumstances, and additionally, the aircraft will be more sluggish to pull out of dives than it would be in AB. Also, you do not have the benefit of a bombing reticle (crosshairs) in RB, as the A-20G doesn’t have a bombardier, and so you have to rely on visual cues, intuition and your skill when bombing. Because of this, you’ll find it helpful to practice a more consistent dive bombing approach than is necessary in AB. One of the bombing tactics developed by A-20G units in the Pacific was to perform a dive, typically a shallow dive, but at times up to 45 degrees, and use the nose of the plane to gauge the distance to the target. Just like the the real pilots did, you’ll have to use the nose (or tail) of your plane to know when to release your bombs. The rule of thumb is that a steeper angle reduces the spread of the bombs. A 30 degree angle of attack is easy to achieve and makes for a fairly accurate drop. Bombing in RB and SB, without a bombardier, takes practice. The images below show the exact moment of bomb release in a successful attack approach on a pillbox during a RB match. One thing to keep in mind is to allow yourself room for recovery after a dive. Keep at least a couple hundred feet of altitude from the target after you release the bombs or the blast could damage your plane, especially the control surfaces. In 1936 the Douglas Aircraft Company began design work on a project with the aim of creating a new twin-engine attack aircraft. This project was known as the DB-7 at Douglas, but would eventually become known as the A-20 Havoc. The first client was not the USAAC, but the French, followed shortly thereafter by the British. In British service, the light bomber/attacker was designated ‘Boston’, with the night fighter variant being called 'Havoc'. The line was notable for having been developed with advanced features for the time, including a two-section bomb bay, a tricycle undercarriage and interchangeable noses. The nickname, ‘Havoc’, was soon adopted by the United States Army Air Corps, which began ordering the aircraft in June of 1939 upon seeing the improvements made to the aircraft for the overseas clients. Several versions of the A-20 were developed, with many serving in the air forces of Allied countries, most notably the USSR under the Lend-Lease program. By the end of the war, the USSR had received more A-20s than the USAAF. Over the course of its many iterations, the A-20 was used as a high, medium, and low altitude bomber, low-level attacker, fighter, reconnaissance, and night fighter. It fought in all theaters of WWII and was used by many countries, even after the war. The last A-20 was built in 1944, and the line was retired from US service in 1949. Interests:Aviation, Space, sailing, and food. I also draw the occasional plane. Error: The dorsal turret cannot rotate 360 degrees, it is unable to fire forwards. The rotate field is closer to 270, I would say.